HiltonHead.com » Events » 2019 Haunted History Tours! This event is running from 27 March 2019 until 29 November 2019. It is next occurring on 22 April 2019 8:00 pm. Tags: 2019 Haunted History Tours! Mondays, Wednesdays, Fridays: 2019 Haunted History Tours! Zion Chapel of Ease Cemetery, 574 William Hilton Pkwy. Told in Hilton Head’s oldest and most haunted burial place, our stories have a macabre twist and are sure to raise the hair on your neck. 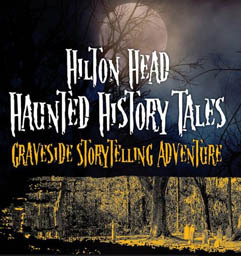 More history than horror, our tales involve real events that have occurred in Hilton Head’s 500 year history and real people who once lived here and are still reported to roam the Island from time to time. Admission is $25 per adult and $20 per child ages 8-16. 8 p.m. Ticket is required for entry. Click here to register online or call the Heritage Library at (843) 686-6560.